Roy L. Napps (1919 – 1998) began working in the heating and air conditioning industry in his early 40s, when he took a job with a leading Tyler based air conditioning company. He worked there until World War II began when he went into the Army and served until 1946. He served in different capacities during the war, but much of his time was spent being in charge of maintaining military heating and refrigeration equipment in India. He gained valuable experience in the industry during the war and completed college level courses in the refrigeration and air conditioning field while he was in the service. After the war, he returned to the Tyler based air conditioning company and moved up rapidly in the organization because of his work ethic and problem solving ability. The decision was made in the early 1950s to have Roy Napps open a branch operation in Longview. He directed the construction of the branch office facility in Longview and began building the business in the Longview area. Business grew over the next few years under Roy’s leadership, but the decision was made in the mid-1950s to close the Longview office and bring all work back to the main Tyler office. The Napps family moved back to Tyler and Roy returned to the Tyler office. He worked in Tyler, but his desire was to return to Longview and serve the heating, ventilating, air conditioning and refrigeration needs there. Within a year Roy Napps gave notice, returned to Longview and started Roy Napps Air Conditioning in 1957. The air conditioning business was very different in the 1950s. There were very few air conditioning companies, and central heating and air conditioning systems had to be custom designed for each application. Packaged air-conditioning equipment as we know it today was not available. Players in the heating and air conditioning market had to be skilled in manually running load calculations for the area to be conditioned, and then proficient in selecting each heating and air conditioning component, such as blowers, coils, pumps, compressors, expansion valves, and piping to affect the installation of a balanced system that would meet the application requirements. This is particularly true of the commercial and industrial market where Roy Napps chose to focus his business. Roy Napps started the business at home with his wife Pauline operating the office and the business quickly grew. He began doing heating and air conditioning work for some of the largest commercial and industrial accounts in East Texas. These accounts included hospitals, multistory hotels, office buildings, and process plants. One of the early systems he designed and installed was used for blast freezing meat in a meat packing plant. The system quickly chilled 100s of pounds of meat to 40 degrees below zero in a matter of minutes. Texas Eastman opened its operation in Longview in the mid-1950s and Roy Napps Air Conditioning Company was engaged to support the plant with heating, ventilating, air conditioning and process refrigeration system installations, service and maintenance. One of the services the company offered Texas Eastman was the design and manufacture of very large specialty explosion proof package chillers and control room systems. Roy Napps was not only committed to serving East Texas with heating, ventilating, air conditioning and process refrigeration services, he was also committed to teaching and mentoring others to meet the growing demands of the industry. While keeping up with the demands of running the business, he always found time to teach air conditioning and refrigeration vocational courses at Longview High School, Kilgore College and local trade schools. Because of his love for people and his profession, he continued to invest in others by teaching and mentoring throughout his business career. Roy Napps Air Conditioning Company continued to grow through the 1960s and into the 1970s. Along the way Eddie Napps, his son, had worked with and had been mentored by his dad in every phase of the business since he was a young teen. Eddie Napps went on to the University of Texas at Austin after high school and graduated in December of 1971 with the degree of Bachelor of Science in Mechanical Engineering with Honors. He was now ready to fully invest himself in the family business. 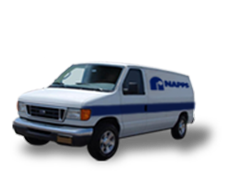 Roy and Eddie Napps worked alongside each other until 1975 when Eddie Napps took over ownership and incorporated the business as Napps Industries, Inc. doing business as Napps Heating and Air Conditioning. At this point Roy slowed down a little and Eddie took the lead. It was Eddie’s desire to strengthen and grow the business as a regional residential and commercial heating, ventilating, air conditioning and refrigeration company while pursuing the manufacture of specialty refrigeration packages. The company was strengthened and enjoyed steady growth over the next ten years. Headway was also made in marketing large specialty refrigeration packages, but in the fall of 1987 Napps Industries received an order that would radically change what Napps would bring to the international market! In the fall of 1987 Napps received an order from Teledyne INET to design and manufacture one of the first central system package chillers that would be used to cool commercial aircraft. This order was for equipment to cool Delta Air Line’s fleet of commercial aircraft while parked at the Orlando International Airport in Orlando Florida. The job was successful and Teledyne immediately began positioning Napps to furnish all systems internationally. The volume and type of work this opportunity presented would inevitably interrupt and compromise the core business of Napps Heating and Air Conditioning. Napps Heating and Air Conditioning has continued to grow and today Napps remains a committed regional company with a reputation of service excellence in the East Texas area. Napps currently provides professional heating, ventilating, air conditioning, refrigeration and plumbing services to homes as well as hospitals, clinics, schools, offices, retail spaces, hotels and motels, manufacturing facilities, and petrochemical plants generally within a 60 miles radius of the corporate offices in Longview Texas. Napps’ service technicians are experienced professionals with advanced training in their field and are technically prepared to diagnose and repair the most complex systems in our industry. These front line service technicians are supported by a senior management team with more than 100 years collective experience in the industry and a design / replacement team equipped to quickly design equipment replacement solutions to get systems up and running in a minimum amount of time. The NAPPS team has the capacity and personnel to quickly and efficiently replace residential, commercial and industrial equipment. Commercial and industrial work can include large boilers, chillers, pumps, cooling towers and other related equipment with associated controls, piping, sheet metal duct, insulation, metal fabrication, and hoisting. Commercial and Industrial services also include professional maintenance programs with formal PowerPoint presentation as well as web access to all maintenance and service records. The Comfortable Choice in East Texas since 1957!